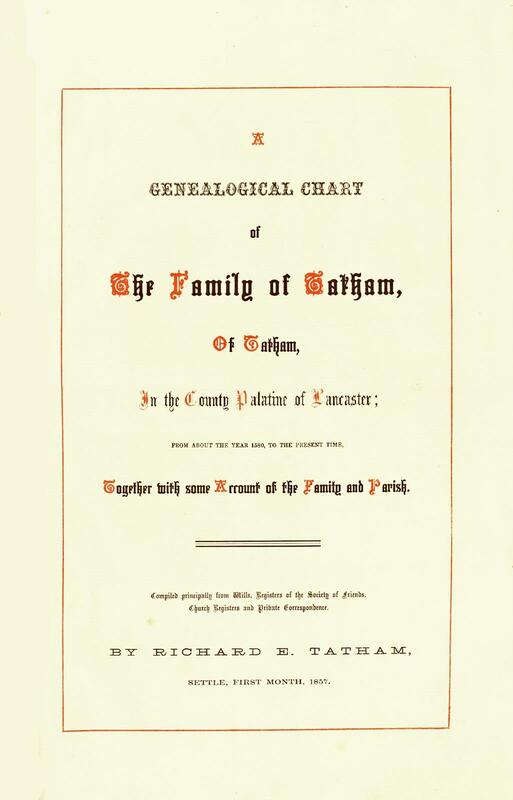 In 1857, Richard Eckroyd Tatham published privately A Genealogical Chart of the Family of Tatham of Tatham, showing all the descendants of John Tatham of Tatham, born around 1580. As well as the chart, it contained 15 foolscap pages, including an index of names, notes, extracts from books containing information about the history of the parish, and a map. The chart is over 13 feet wide, and was apparently folded into the book as its Page 7. An original complete copy can be viewed at the Lancashire Record Office in Preston; it is on the open shelves, under reference TAT. It is not known how many other copies were printed. Brigham Young University (BYU) in America - a foundation of The Church of Jesus Christ of Latter-day Saints (Mormons) - has on its website a PDF copy of the book, but not the chart. That copy has appended to it a letter, written in 1962 by the Rector of Tatham, Revd. Grange, to an American woman, Mrs. Tuttle, who had visited the Rector, and had asked him to supply her with a copy. Having promised to do so, he realised, when he had spread out the chart on the floor, that copying was not going to be an easy task, and decided instead to send it to her on loan so that she could do the copying. This must have been the source of the BYU copy. Was the original returned? The chart is a remarkable achievement. Richard Tatham had few of the aids available to today's family historian: no family history centres or websites; no access to personal census information; and the statutory registration of births, marriages and deaths was a recent innovation. Even more remarkable is the fact that he was only 18 when he completed the chart in 1856. Richard Tatham was a Quaker, born in Settle in 1838. He went to Ackworth School, Pontefract, and then to school in York, before working for 4 years in his father's business in Settle. In November 1857, he moved to York, where he worked for Joseph Rowntree, returning to Settle in early 1860. In February that year, with the help of his brother and his father's apprentice, he started a Sabbath School for young people (15+) and adults. In the summer of 1860, he began to show signs of a serious lung disease, which eventually caused his early death in 1861. For further biographical information, see The Sabbath School Teacher: A Memoir of Richard E. Tatham by John Ford, published in 1861: "a simple record of his short but bright course of earthly service". Richard E. Tatham's genealogical work can be viewed using the following links. 1. The book (excluding the chart). This is the BYU version, with Rev. Grange's letter appended. 2. The whole chart in one strip. 3. The chart divided into 14 sections. The sections are sized for A4 portrait printing, with overlaps to facilitate joining them up into your own giant chart. Tatham History Society is indebted to Phil Fern for providing the PDFs of the chart. Some parts are a little faint; the PDFs came to Phil as copies of copies, and he doesn't know how far removed they are from an original printed copy. He is a genealogist, and a descendant of John Tatham, and has discovered some errors in the chart, so its accuracy can't be taken for granted.